His life story is just as celebrated as the many voyages and polar expeditions he participated on. Jens Munk (1579-1628) was one of the first and most experienced polar explorers who tried to find a shortcut to the Far East via a northwest and northeast passage. Jens Munk's childhood was spent in southern Norway, in Arendal and Fredrikstad, and in Danish Ålborg. 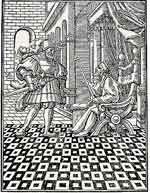 His youth was not easy since his father, the notorious Erik Munk (d. 1594) - peerless and disgraced - ended his days in a Danish prison. Jens Munk though left for a life at sea as a 12-year old. Via England and Portugal, he eventually arrived in Brazil, where he stayed for six years. And by 1598, he was back in Denmark where he began his career as a seafaring tradesman. He left on a dramatic voyage to Novaya Zemlya in 1609. The expedition he was on sailed into a raging storm in the Arctic Ocean. A ship got locked in ice and the crew was barely able to make its way to land near Archangel. The following year the king ordered him to return to the same destination to find the Northeast Passage. 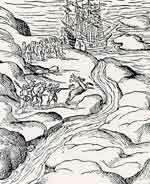 This time, though, the expedition was halted by ice and had to turn back when it got to Kildin, on the Murman Coast. Beginning in 1611, Jens Munk was commissioned as a ship master by the Danish-Norwegian king, Christian IV, and, during the Kalmar War (1611-1613), Munk made great progress. Afterwards, he was given important tasks to complete in both southern and northern latitudes. He left for Spain, for instance, to hire Basques who could participate in Danish-Norwegian whaling. 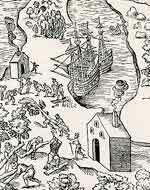 Then, too, he captured Jan Mendoza - the most notorious pirate of his times - off the northern coast of Russia, in 1615. Not much time elapsed before Munk was known to be one of the best officers in the Danish-Norwegian navy. However, the dream of his life began in earnest in 1619 when he was ordered to find the Northwest Passage, which was believed to stretch from the Hudson Bay to the Pacific Ocean. The ambitious Christian IV had devised a great plan for controlling the arctic straits of the northeast and the northwest in order to gain access to the riches of the East. It was believed that a northern route to Japan and China (Cathay) would be much quicker to travel upon than the usual trade routes. And it was even suggested that by sailing northward, the distance would be a mere fifth of the traditional route encompassing Africa and the Indian Ocean. In May, Jens Munk sailed from Copenhagen with a company of two ships and 64 sailors. The voyage proved to be dramatic. Due to faulty navigational equipment, it was difficult to determine their position: problems arose due to ice and currents, the vessels sailed into a labyrinth and they could not locate the Hudson Strait. Having found the strait after suffering many hardships, it was so late in the year that Munk saw no other option than spending the winter locked in the ice. 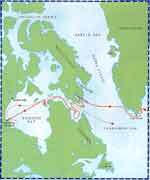 The expedition then wintered at Munkhaven, the mouth of the current Churchill River, in the Hudson Strait. But the lack of vitamin-C resulted in the sailors' worse fear: an outbreak of scurvy. This spread quickly and lethally among the crews. And when the ice finally opened, in June 1620, there were only three survivors left. Jens Munk was one of them. Incredibly, he and the remaining two men managed to sail one of the vessels across the Atlantic to Norway, which they reached at the end of September 1620. Following some disturbances in Bergen, he was thrown in jail but was later paroled, by order of the king, only to return to Copenhagen some time near Christmas in 1620. Despite the Hudson Bay experiences, Munk continued to serve as a polar explorer and Danish diplomat. He sailed to Malmis (Kola City), in 1623, as admiral of a naval assault force that retaliated for a Russian attack on Danish traders. The havoc evoked in Malmis was horrendous. It resulted in grave relationships between Denmark-Norway and the Russian czardom. 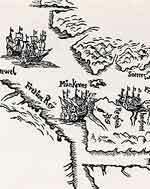 In 1624, however, Munk was once again at sea in the north, this time ridding coastal waters of pirates. Jens Munk served as a loyal naval officer until his death in the summer of 1628. Despite the failures of his greatest schemes, his reputation has lived on as a highly respected sailor and polar explorer.